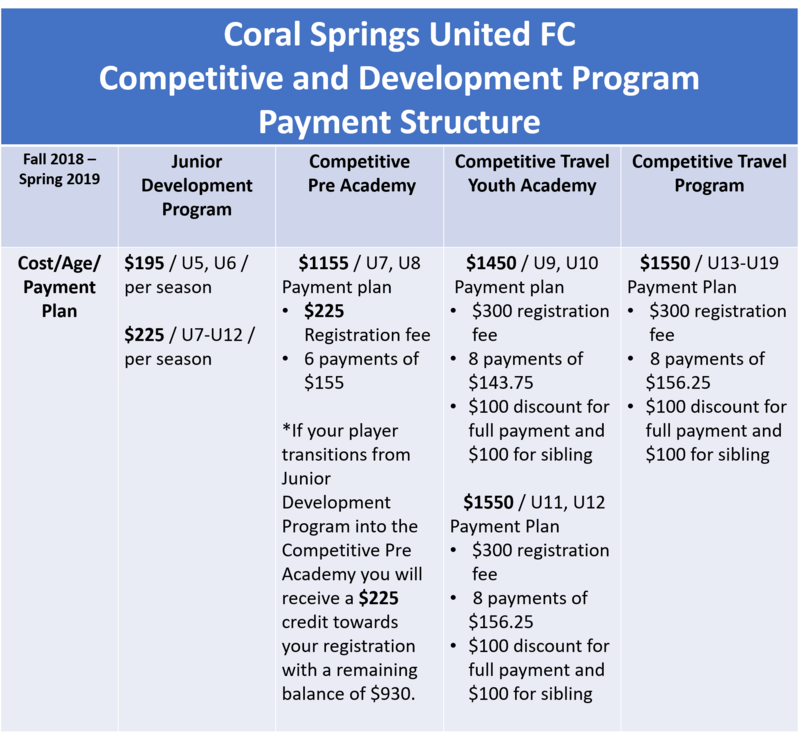 2018 - 2019 Competitive Player Selection and Player Registration Information | Coral Springs United F.C. This year players will be contacted by coaches & staff via email or phone throughout the tryout process to notify them if they've been selected. (1) Online registration is available and will be opened on June 1st, 2018. (2) Coral Springs United will hold "in-person" registration and uniform sizing for all players selected to competitive teams (U9 through U19). If we do not receive registration or acceptance by Wednesday, June 6th, we will begin to offer the next available player on our list your roster spot. In-Person Registration will be held on Wednesday, June 6th, 2018, from 5:30 pm to 9:00 pm at The Heron Bay Marriott, 11775 Heron Bay Blvd, Coral Springs, FL 33321. Uniforms: sample uniforms are available to try on and order during the registration evenings only. Everyone must order uniforms as we are changing over to a new uniform style for 2018-19. If you have any questions or concerns about the registration process or need additional information regarding the player selections, please contact us at coralspringsunited@bellsouth.net. We look forward to seeing you on Wednesday at the meetings! Thank you and Welcome to Coral Springs United FC!